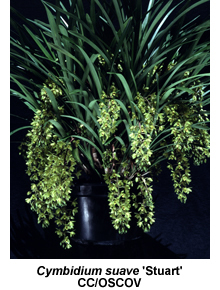 There are three Cymbidium species indigenous to Australia, namely Cym. canaliculatum, Cym. suave, and Cym. madidum. They are found in Queensland, with Cym. canaliculatum extending westward across northern Australia to Western Australia and Cym. suave extending south to southern New South Wales. Cym. madidum is largely confined to Queensland, with only a small extension into northern New South Wales. They are all generally found in association with trees but are more appropriately considered as terrestrial rather than epiphytic, as their roots penetrate the rotted heartwood rather than attach themselves to the sound timber. All are small flowered, have leathery leaves and their leaves closely surround the pseudobulbs. When the leaves fall the bases remain as tight dried sheaths, and sharp spines remain at the dehiscence points. They flower from spring to early summer, those plants in the north flowering earlier than those in the south. Cym. 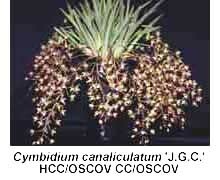 canaliculatum, first described by Robert Brown in 1810, is the most widely distributed and is more tolerant of heat and dryness than the others. It has extremely leathery leaves and multiple inflorescences of densely packed, variably colored flowers, even on the same raceme. The flowers display four general color patterns, giving rise to four varieties or groups. Cym. canaliculatum var. canaliculatum is the common form with red brown blotches overlaying a green to yellow background. Cym. canaliculatum var. marginatum has red brown flowers with a distinct yellow green margin, while Cym. canaliculatum var. sparkesii is solid red brown to almost black without any green. There is also a rare albino form that is clear green. Because Cym. canaliculatum prefers a drier habitat, it is most commonly found on the western slopes of the Great Dividing Range and the western plains in the east and the coastal forests rather than the rainforests in the north. Cym. canaliculatum var. canaliculatum is typical as the southern form while Cym. canaliculatum var. marginatum and Cym. canaliculatum var. sparkesii are found in the north of its range. Cym. madidum, first described by Lindley in 1840, prefers a higher humidity and moisture level and thus grows on the eastern slopes of the Great Dividing Range and the coastal plains. 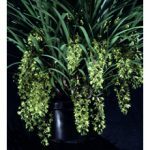 It is characterised by very large pseudobulbs and long pendulous inflorescences with widely spaced green to yellow flowers. Cym. madidum is commonly found growing in the bases of elkhorn and staghorn ferns or in the rotting heartwood of trees and branches. Plants can grow into huge clumps that flower between September and December, the northern forms flowering earlier. Cym. suave is found in a narrow band along the eastern seaboard from northern Queensland to southern NSW and was first described by Robert Brown in 1810. It prefers an environment between those preferred by Cym. canaliculatum and Cym. 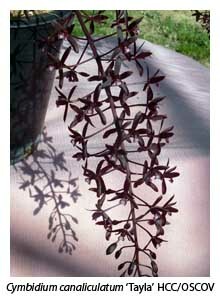 madidum and is characterised by canes, rather than pseudobulbs, that continue to grow and flower for a number of years. 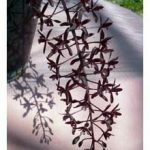 It is found growing in the rotting heartwood of Eucalyptus or between the flaking layers of bark of Melaleuca; it sometimes produces rhizomes that will run for a considerable distance before surfacing and producing leaves. Cym. suave requires a considerable amount of sunshine and is the coolest growing of the three species. The flowers are similar to those of Cym. madidum. Select forms of each of these species are now grown and their specimen plants make a magnificent display when in full bloom. A protected environment with added heat during winter may be required in the southern states. 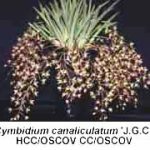 Because of their individual charm, the fact that they are part of our national heritage, and the variety and extension of flowering time that they provide, the Australian species cymbidiums are worthy of a place in any orchid collection.